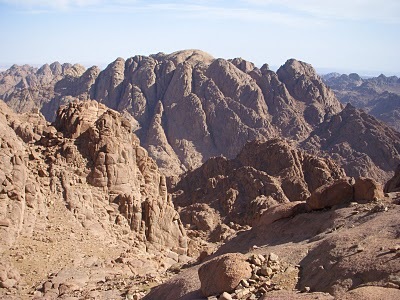 This is the Mountain of St Katherine, the tallest mountain in Egypt. I just posted over 100 pictures on shutterfly. 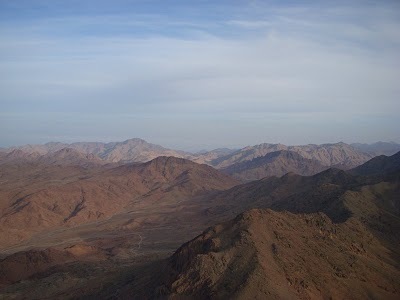 I decided to head back to Dahab for a few days before going to Nuweiba. I was able to take a close look at the Middle East Lonely Planet book from a fellow traveler for what my tentative plans might be for the summer. I was reading that if a person gets a visa on arrival at the airport in Lebanon, then the person can get a fifteen day visa into Syria if they have a visa from Lebanon first, although the book is two years old and I will be doing more research on the subject. I am staying at the same camp on the sea from when I left nine days ago here in Dahab, I open my door and their is the sea, crystal blue. I rented some snorkeling gear for 7 pounds a day from this camp. So very peaceful being in the water watching all the fish swimming around. I stayed at the Fox Camp for nine days in St Katherine. The camp is a very relaxing, quite camp, although how things ended up was very interesting. I was there for five nights, then, one girl from Canada showed up at the camp traveling alone, and seemed kind of battered from dealing with the Egyptian men. We got along very well, we talked about our experiences in Egypt, which some are not all that positive, although true – she stayed at the camp for four nights. Then another girl showed up from Australia and stayed two nights. We all got along very well enjoying normal male – female interaction. The staff ended up bent out of shape, big time. Like I was saying, emotional weakness – without any inner self-control. This has been the case, for the most part, traveling in Egypt the last five months with hotel staff. We all three decided to head out and stay in Dahab for awhile on Friday. 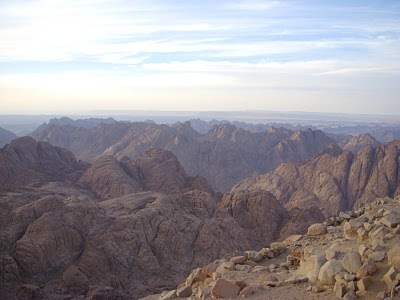 The Canadian women and I might be going to Nuweiba together then she will be heading to Israel. The Australian women is also going to Israel, although I will be heading to Jordan. We all had dinner last night here in Dahab. 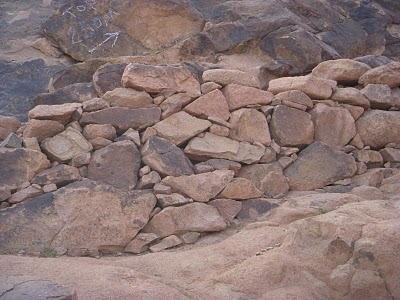 This how the stairs are made, by layered rock. Like I said, after seeing the stairs, anybody that puts their mind to something – they can do it. Jealousy is rotten to the bones – darkness at its best. The separation of the sexes is very unhealthy, and causes emotional problems within a society that has cultivated fear and shame regarding normal interaction between the sexes. Considering that the culture is very old and suppressed, in some areas of life, due to the fact that women stay at home in many areas of the country, and men interact with men – only; the presence of the western female affects these men into these immature, emotional basket cases without any self-control. Living with a perception without understanding how to show respect, “Men” without any strong, deep inner spirituality, although claiming to know “god”, become subjected to the emotions of being jealous, envious, they end up with a confused mind and timid toward normal interactions; due to the fact that they can’t interact with women in their own country in a normal way – shame, humiliation, and other such emotions comes to the surface also. The view while climbing the mountain. The last two days they really got bent out of shape since both women latch on to my company, because the girls didn’t trust the slimly staff of the hotel. What an experience – observing the inner motivations of the heart of man. The deep inner want of craving and yearning is the result of the separation of the sexes, which is a form of enslavement. Consequently their religion is no match for the powerful inner emotions of the darkness. A completely different world, a different life style – extremely dogmatically positioned which creates fear when threatened – anger lurks at their door. This is the world which is ruled by the wicked ones, don’t think this type of behavior is only limited to Egypt. The darkness rules the whole world, humans have always been humans inflected with the ego, self-centered motivations, inner negative emotions which the only way to conquer the darkness is by learning how to do what is good and acting not just taking – especially toward our fellow man. 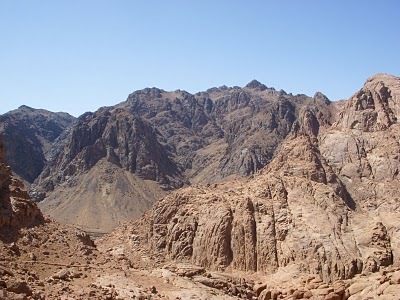 Next post: The Mountain of Moses! 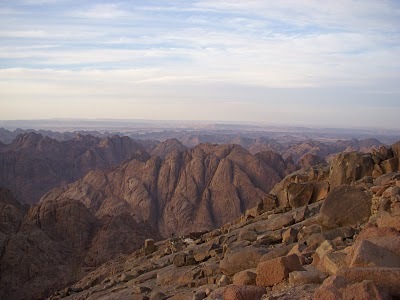 Previous post: Update: Mount Sinai – St. Katherines.